In the past few months, I’ve decided to reinvent myself through a strenuous workout regimen. Suffice to say, this has not been easy, but I am finally beginning to experience the results that I’ve always desired. Although I generally like to focus on cardio, I also want to be able to build the muscles in my arms and shoulders. In order to do this, I decided to purchase a pair of adjustable dumbbells. I shopped around and attempted to keep the price to a minimum. Since I didn’t need dumbbells over 25 pounds, I decided to check out the XMark Adjustable Dumbbells. Below, you will get to understand more about these dumbbells and my experience so far. Before I purchased the XMark 25 lb. 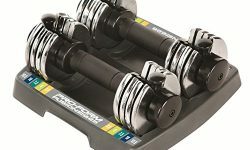 adjustable dumbbells, I scoured the Internet and explored many other brands. I noticed that many of the dumbbells were awkwardly large and especially long. When I saw the XMark, I knew instantly that they were the right size for me. They’re not too long or bulky. They’re actually very similar to the size of a regular dumbbell, which pleases me greatly. On the other hand, I noticed the chrome design and was impressed. This design is capable of fitting in any gym very easily, without looking weird or strange. During my initial search, I came across a large number of adjustable dumbbells, which were fitted with the turn dial adjustment system. Although this seems to be the trend, I decided to try something different. The XMark 25 lb. adjustable dumbbells (Available singles or Pair) use a slider. 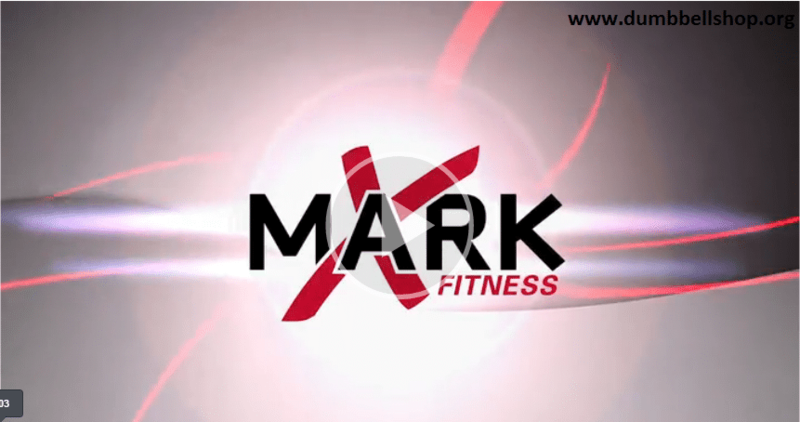 Everything is easily marked, which makes it easy to slide the lever to your desired weight, lift the dumbbell and begin performing your workouts. Some individuals have reported difficulty getting this mechanism to work, but so far, I have yet to experience any difficulties. For me, it was crucial that I purchased a pair of adjustable dumbbells, which were capable of providing me with at least 25 pounds. Although I may eventually build up to greater weights, I don’t need them anytime soon. This definitely helped to sway my opinion and influenced me to purchase this set. Many people have offered negative criticism for the dumbbell’s limited versatility, since they only offer 5 pound increments. Again, I haven’t experienced a problem with this. Instead of purchasing 5 different dumbbells, I can easily utilize this specific set and get the same workout. There are some additional features, which should be mentioned. For instance, the dumbbells offer a capacity of 9 individual weight settings and can be used for more than 30 different exercises. A limited warranty, which only offers a year of coverage, is included. Although this is definitely limited, it offers a tiny bit of comfort. Just hope your dumbbells go awry during the first year. Since I was unwilling to purchase a whole bunch of dumbbells, I made the next best choice of purchasing this product. 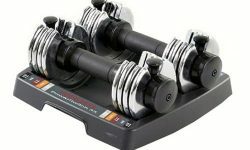 For the price, I have been more than impressed and would certainly recommend these dumbbells to everyone. 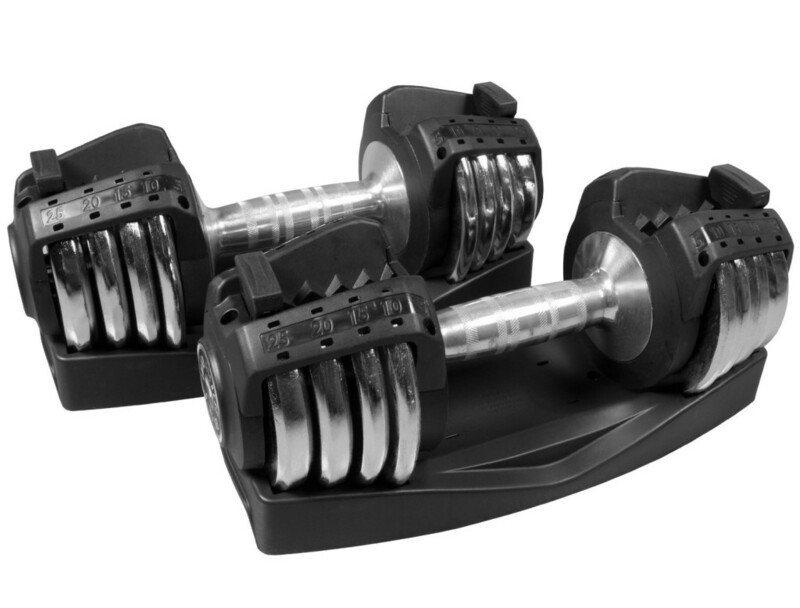 If 25 pounds is enough, this set of XMark adjustable dumbbells should be your first choice.